I began this survey with a discussion of a mezzo-soprano, Magdalena Kozena, who seems to me more a pure soprano, and continued with a disc of songs by French women composers sung by a "mezzo-contralto", Rebecca de Pont Davies. The rich tones of this latter singer were extraordinarily well-suited to the sultry, languorous, fin de siècle tone of this music, or at least to the songs chosen, for none of her five Chaminade pieces are doubled on Anne Sofie von Otter�s disc which shows the composer in a totally different light. Just put it straight on at the opening "Ronde d�amour" and you will be a dull fellow if you are not bowled over by the scintillating display of the keyboard, or if you are not captivated at once by the way the singer goes into her "Ahs" with a whoopee of joy. With few exceptions, the selection here replaces fin de siècle weariness with an upfront celebration of the belle époque. Though we have no direct comparison with de Pont Davies, it is illuminating to listen to the piece here which, more than any other, one can imagine would have suited her well, "Viens! Mon bien-aimé!". Here we begin to get an answer to the question, "What is a mezzo-soprano?" for Otter�s lighter timbre is plangent, infinitely modulated, with none of the heaviness, that sense of having been dragged up from unimaginable depths, which we associate with a contralto, and which we get from de Pont Davies. But, if Otter is clearly not a contralto, she is equally clearly not a soprano. For, while she delights us with her agility, her joi de vivre and the sheer ease with which she carries her plangent tone up to a high B flat when called for, she remains an oboe rather than a flute. So the difference between a soprano and a mezzo-soprano is one of timbre as much as of range. Otter does not in fact go very low, and when she does she helps herself out with a touch of chest, but you can hear all through her range that she is a mezzo. More importantly for Chaminade, she is also a wonderful interpreter, one of those rare musician who sing the music rather than the notes. The shape and meaning of every phrase is made crystal clear to the listener � considering that most of the songs were found and learnt for the record I find her total absorption of them quite miraculous. On a technical level I find it interesting how much portamento she allows herself. It could be dangerous, but she seems to know exactly how far she can go so her voice seems free and untrammelled; the effect is never mannered or ungainly. Her partnership with Forsberg is also a wonderfully vital and productive one. 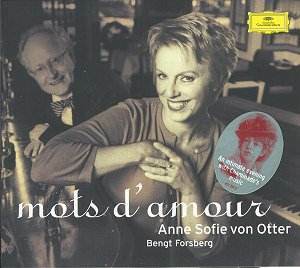 Don�t be misled by the charming booklet photo (on the cover they both look like cats that have swallowed pigeons) in which Forsberg looks like a benign absent-minded professor and Otter has the sweet, slightly bored smile of a Meg Ryan look-alike. He�s got fire in his fingers. (By contrast, what a sad face Chaminade herself had, according to the photograph opposite). The violin and two-piano pieces go with plenty of verve too, but they do rather point up the fact that the magic of a great artist is needed to bring this music to life. They begin so exuberantly but after a while you have to pinch yourself to remind yourself how much you�re enjoying it. Still, the songs are the thing. With a rich but not overbearing recording masterminded by Andrew Keener, texts and translations (interlaced with nice photos of the often very decorative covers of the original editions of the music) and detailed notes, you get everything you need, though I was brought up short by reading in the English version that in 1913 Chaminade returned to London "where Queen Victoria regularly invited her to Windsor". I found myself wondering how much longer the good Queen�s posthumous invitations continued and what one had to do to obtain one, but turn to the original French and all is revealed. The new century is in its infancy and none of us will be around when they start selecting "21st Century Gramophone Classics"; but I have the idea this will be one of them. If you enjoy it and want more, then get the de Pont Davies disc too (LORELT LNT109). You�ll be amazed at how different the same composer can sound.